After smearing mascara and giving up on eyeliner, I finally bought a fabulous 10X magnification mirror. Not just any 10X mirror, a high-quality mirror with circular lighting on a beautiful brushed nickel stand. Fully prepared to apply flawless mascara and eyeliner, I sat down fresh-faced with my 10X mirror. Then came the tears. . . If you haven’t seen yourself lately with bright lighting and magnified by 10 times, you haven’t lived. It brings all new meaning to the word “reality”. Like me, your near vision may be a little less sharp than it used to be, or maybe you just wanted to get up-close-and-personal with your face. Whatever your reason, 10X mirrors have become a standard fixture on many a bathroom vanity. I can only hope that not everyone experienced the same shock at seeing every pore, wrinkle, blemish, and line. But there is a positive here. Once I saw my skin up close, I knew what I needed to do. I needed to improve my skin tone, texture, smoothness, and luminosity. Oh, and Botox and a touch of filler was definitely in order as well. Azul has a marvelous product for regular, gentle exfoliation called Exfoliating Lotion. It works fabulously in between your facial or dermaplaning appointments and plays well with physical exfoliators like Clarisonic® or scrubs. Adding a targeted treatment afterward ensures the greatest penetration and best results. I suggest Azul’s Intensive Renewal Serum because it has hyaluronic acid (HA) for collagen formation and improved skin tone and growth factors. You may also choose to add a brightener like Dermal C to lighten and brighten skin tones. Once your skin has adapted to regular exfoliation and application of an HA or vitamin C product, other treatments can be added in and used in alternating fashion. I sprinkle in a hydroquinone for brown spots and occasionally the Azul Salicylic Wash when trouble pops up. After that first close up of my face in the 10X mirror, I was (sadly) surprised at what I saw. But now when I look, I have to say I am pretty pleased. My skin is significantly better than it used to be and I look younger than I did – in person and at 10 times magnification! If you haven’t been loving your 10X mirror, there’s hope! Our highly trained and super-friendly Azul Estheticians are happy to see you at a Complimentary Consult and get you started. You’ll feel so much better knowing that you are using high-quality products, in the right way, to get you back to loving your face – even at 10X magnification. 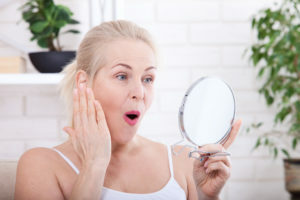 We look forward to seeing you for your complimentary consult – 239-415-7576 or visit AzulBeauty.com for more information.